The designing and work on this bathroom is simply splendid and marvellous. 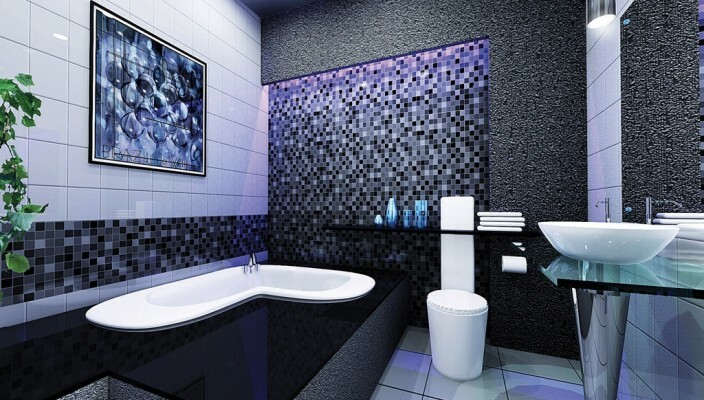 A perfect combination of invariable checked tiles with the color combination of black and white is quite appreciable. A beautiful bowl shaped wash basin enhances the beauty of the bathroom. The textured walls are complementing to the entire scene of the bathroom. The glass fittings are perfect for serving multiple purposes apart from storage. The lightings are wonderful and adding more to the luxury of small bathroom. The plain white fittings are magnificient adding more deluxe touch to the entire set up of the bathroom. The bathroom even though small in its size, is an exclusive set and no less than big and magificient ones. The multi-checked tiles as the base tiles are adding drama to the simple lining of the main tiles. One can actually end up spending more time than necessary in such a beautifuly designed bathroom.